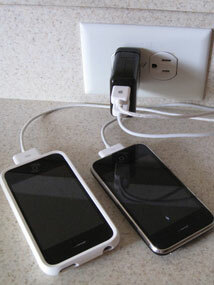 The Exspect Triple USB Travel Charger is the answer to a lot of techno geeks prayers. Quite simply it does what it says on the box. It is a compact charger providing 3 USB ports having interchangeable plugs to cater for just about anywhere in the world. 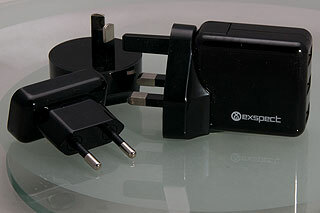 The Exspect Triple USB Travel Charger is available for �20 from Amazon.co.uk and other gadget retailers. As you can see from the pictures the charger has 4 interchangeable plugs allowing Australia, Europe, UK, and USA stye plugs. 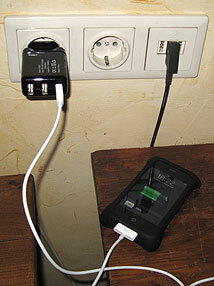 It can cope with a voltage range of 100-240V at 50 or 60Hz as you would expect from a travel charger. Changing the plugs is simply a matter of pressing in the latching mechanism and pulling one plug off and then clicking the new one on. The construction is very sturdy and gives you the feeling of a solid quality product. There is not much else to say about this. It works well and is ideal for use when travelling (or at home) when you need a number of USB charge ports in a small light device. At �20.00 it is a little expensive, but worth every penny to keep clutter down while on the move. 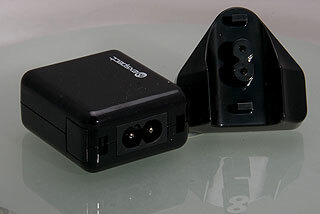 The Exspect Triple USB Travel Charger is available from Amazon.co.uk and other gadget retailers. If you are talking about charging devices in a car, there are many lighter-to-usb adapters including some that have more than one usb socket. Here's page 1 of Amazon UK search for "car usb". Clearly it can as the USB output is 5v DC? But the input is 100-240v AC - he wants a 12v input. With a range of international socket adapters?